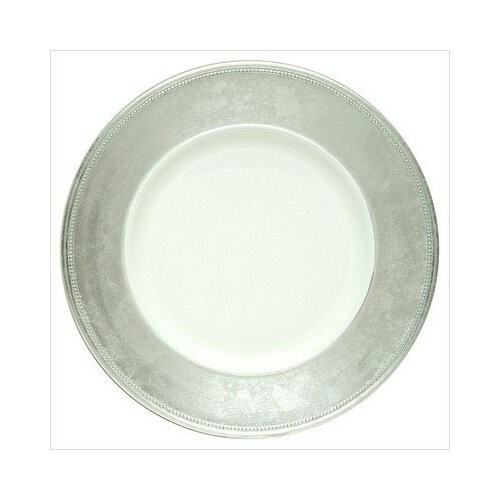 ChargeIt by Jay Broken Silver Leaf Rim Charger Plate 13"
Home > Products > ChargeIt by Jay Broken Silver Leaf Rim Charger Plate 13"
Give your everyday dinnerware an upscale makeover with the ChargeIt by Jay Round Silver Rim Charger Plate. Designed to beautifully frame any size plate, this charger plate boasts an eye-catching silver rim that looks great with any dinnerware collection. Thanks to its premium quality lacquered melamine construction, this charger plate boasts unbeatable durability and longevity. Combining style and functionality, this charger plate not only complements any high-end table setting but also protects against spills and mess that might otherwise stain your tablecloth.